The devotional culture of evangelical women has recently entered the spotlight, as women inspired by the Christian men's group Promise Keepers have begun initiating parallel groups like Women of Faith, Praise Keepers, and Promise Reapers. These and countless other groups of conservative Christian women across the country are more or less newcomers to the institutional landscape that one organization has occupied for thirty years: Women's Aglow Fellowship International. In an effort to understand and illuminate this female culture, R. Marie Griffith spent three years studying this organization. Aglow is an international and interdenominational group of charismatic or "spirit-filled" women, Protestant and Catholic, who meet monthly in local chapters for healing prayer, worship, and testimony. The group also sponsors large national and international conferences, with several thousand women in attendance, and constitutes the largest women's mission organization in the world. 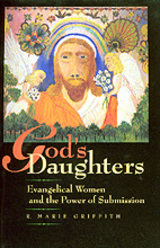 Griffith's careful approach to understanding Aglow, along with the wider female religious culture it represents, crosses the boundaries between ethnography and historical investigation; she elucidates the influence of modern therapeutic culture upon current forms of women's piety and uncovers the important linkages between conservative evangelical women and the feminists to whom they so often seem opposed. By subtly deciphering the complexities of the doctrine of female submission to male authority--long precious to many American evangelicals--Griffith reveals the intricate ways in which women both in and out of Aglow seek unexpected forms of power and liberation from this practice, as from prayer itself. She challenges the simple generalizations often made about these evangelical women and shows how their submissive behavior gains them certain positions of power. "God's Daughters" reveals a devotional world in which oral and written testimonies vividly recount the afflictions of human life and the means for seeking relief and divine assistance. A relationship with God--envisioned as father, husband or lover, and friend--provides a way for these women to come to terms with their own pain, dysfunctional family relationships, and a desire for loving intimacy. Griffith's book is also valuable in revealing the complex role that women play within Pentecostalism, a movement that has become one of the most important and fastest growing twentieth-century world religions, second only to Islam. Exploring in rich detail the social and religious worlds of spirit-filled Christian women in modern America, "God's Daughters" illuminates the language and practice of prayer, its links to the broader recovery culture, and the apparent paradox of the conviction that voluntary submission renders women powerful and engenders liberation. The book will appeal to all who are interested in the intersections of women, religion, feminism, and American culture. In recent decades, religious conservatives and secular liberals have battled over the "appropriate" role of women in society. In this absorbing exploration of Women's Aglow Fellowship, the largest women's evangelical organization in the world, R. Marie Griffith challenges the simple generalizations often made about charismatic or "spirit-filled" Christian women and uncovers important connections between Aglow members and the feminists to whom they so often seem opposed. Women's Aglow is an international, interdenominational group of "spirit-filled" women who meet outside the formal church structure for healing prayer, worship, and testimony. Aglow represents a wider evangelical culture that has gained recent media attention as women inspired by the Christian men's group, Promise Keepers, have initiated parallel groups such as Praise Keepers and Promise Reapers. These groups are generally newcomers to an institutional landscape that Aglow has occupied for thirty years, but their beliefs and commitments are very similar to Aglow's. While historians have examined earlier women's prayer groups, they've tended to ignore these modern-day evangelical groups because of their assumed connection to the "religious right." God's Daughters reveals a devotional world in which oral and written testimonies recount the afflictions of human life and the means for seeking relief and divine assistance. A relationship with God, envisioned as father, husband or lover, and friend, is a way to come to terms with pain, dysfunctional family relationships, and a desire for intimacy. Griffith's book is also valuable in showing the complex role that women play within Pentecostalism, a movement that has become one of the most important in twentieth-century world religions. R. Marie Griffith is Lecturer in the Department of Religion and Associate Director of the Center for the Study of American Religion at Princeton University.